Not everyone shares my enthusiasm for bitter wild greens. Dr. Andrew Well does, and he has written a very persuasive argument why we should include things like dandelion leaves in our diet in this article. This post offers a way to serve wild greens, mixed with other flavours to help your palate get used to the bitter flavours. 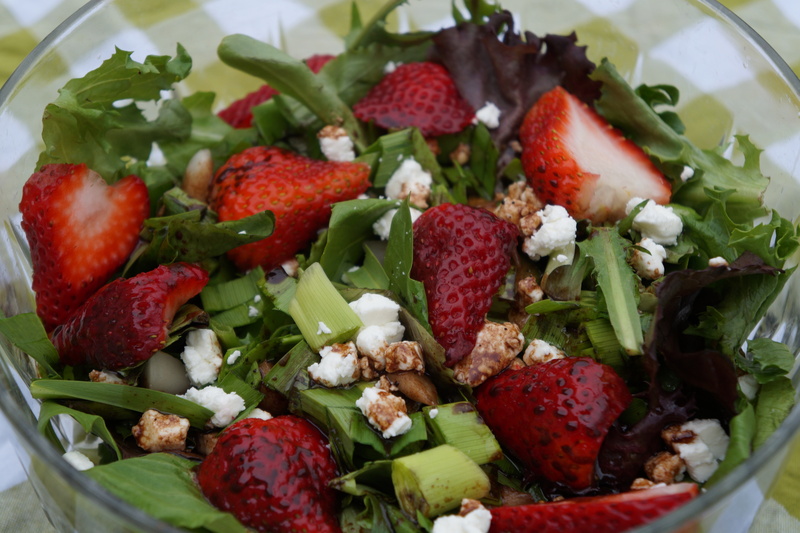 It is a salad of mixed greens with strawberries, goat’s cheese and chocolate balsamic vinegar. The dressing itself is a mixture of sweet (honey) and bitter (chocolate). 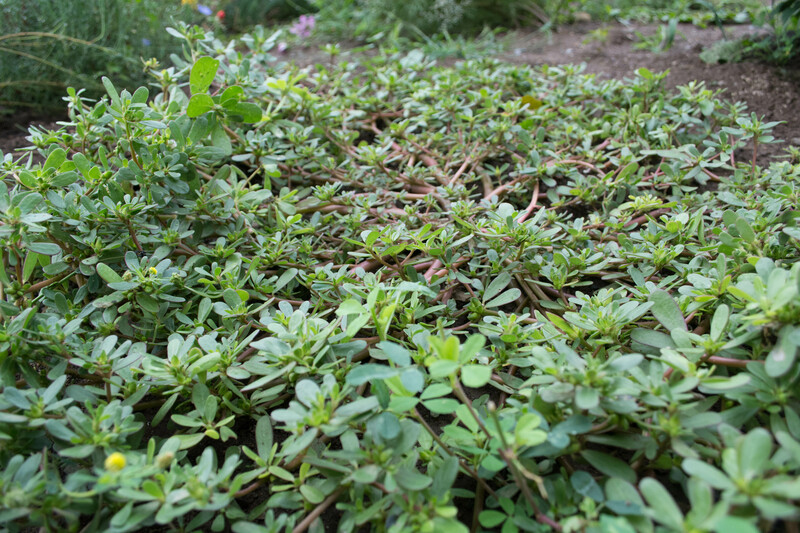 It is the perfect match for wild greens, or any greens for that matter. I was first introduced to the idea of mixing chocolate with balsamic vinegar by a recipe posted recently by Simi at acasadisimi for another kind of salad all together which called for chocolate balsamic vinegar. I had never heard of chocolate balsamic before, so was determined to try it. I chose to make a salad dressing with those two flavours in it – and it worked like a charm. This is as easy as salad dressing gets, but with such a rich combination of flavours, it makes the simplest salad seem like an epicurean treat. Whisk the first four ingredients together. Add the olive oil slowly continuing to whisk. 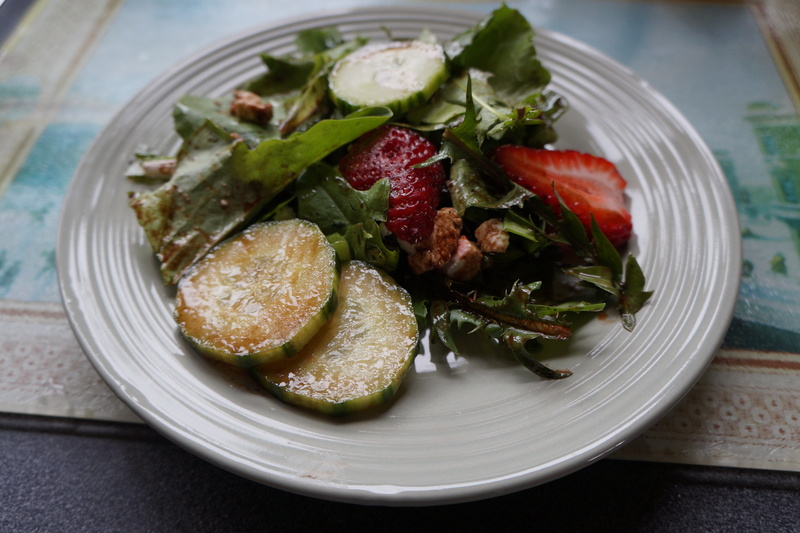 For the salad, I used a mixture of spring greens (including some dandelions, day lily sprouts and tubers), cucumber, crumbled goat’s cheese and strawberries. get-together where I always end up collecting new recipes and inspiration to take away with me. Can’t wait to see what treats are in store for me this week. Categories: edible weeds, recipes, salad | Tags: buckwheat honey, chocolate balsamic, dandelion greens, day lilies, edible weeds, Fiesta Friday, foraging, goat's cheese, green salad | Permalink. 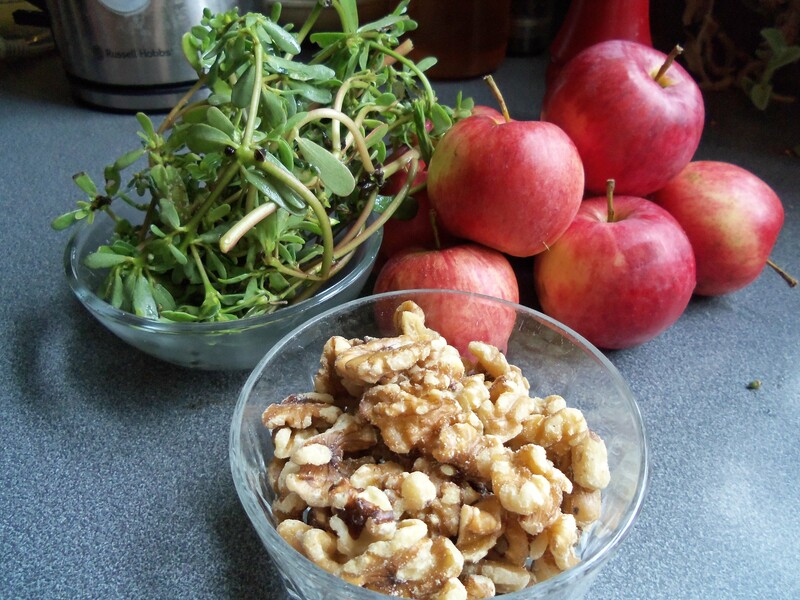 With all the ripening apples falling off the trees, I decided to use some in a waldorf salad so they could be used fresh rather than cooked. 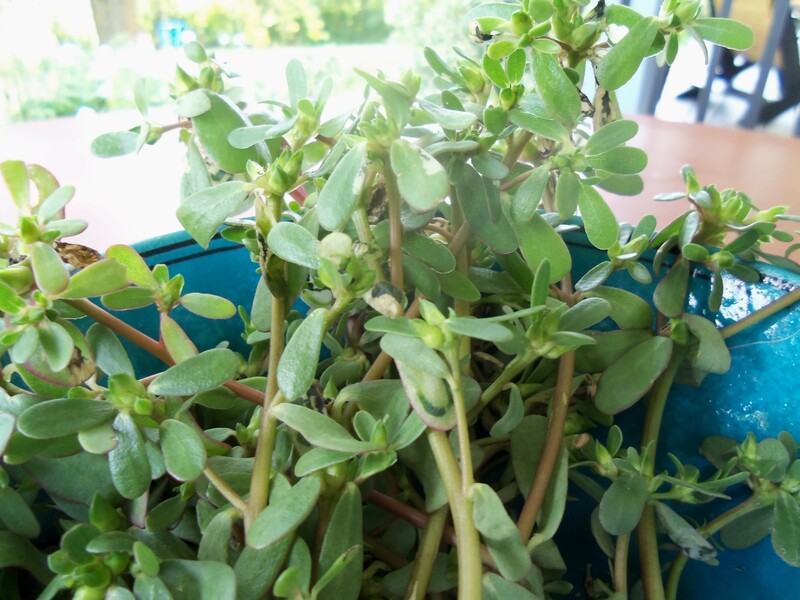 Not having any celery growing in my garden this year, and finding little in the local markets, I decided to use purslane instead. In this version, I used very little mayonnaise, and a little lime juice just to prevent the apples from going brown during preparation. These are the ingredients I used, but feel free to use whatever you fancy. 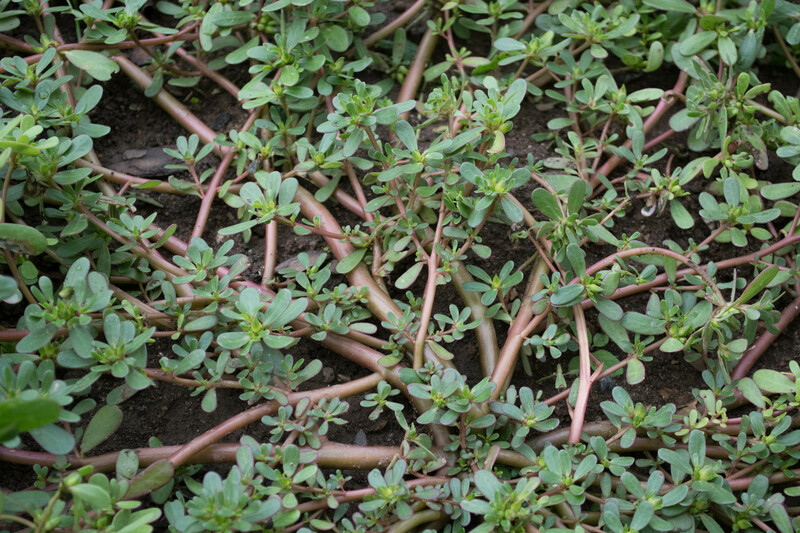 I mixed the lime juice with the purslane, then added the apples and stirred after each apple, adding them one at a time. I left some of the skin on the apples because they are organic, and add some nice colour. Then, I added the rest of the ingredients. 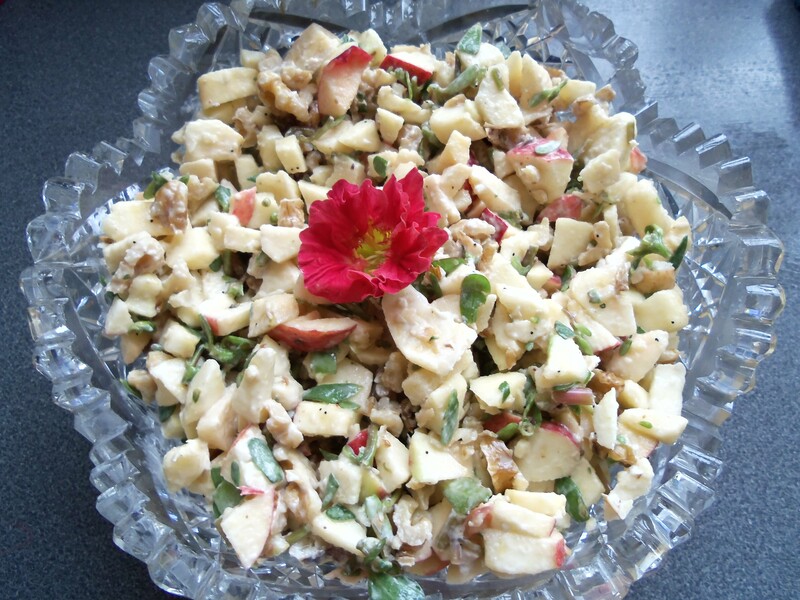 Categories: recipes, salad, salad | Tags: apples, edible weeds, purslane, recipe, vegetarian, waldorf salad | Permalink.